Hooray! The holidays are almost here! Time to get your front porch and outdoor planters looking festive for the season. 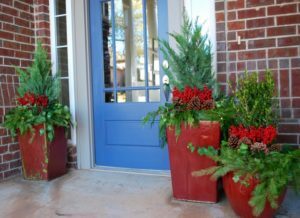 Let’s talk holiday container garden design. We use the “thriller, filler, spiller” design theory. The “thriller” is the one tall plant in the middle that gives the arrangement height. Evergreens are our “thriller” of choice for winter planters, but other good options are red or yellow twig, dogwood sticks or birch poles. Depending on the size of the planter, some good evergreen options are Leland cypress, boxwood, juniper and dwarf alberta spruce. Next comes the “filler” which fills in around the middle of the planter. Our favorite “fillers” for the holidays are pinecones, berries and ornaments. Lastly, comes the “spillers” which cascade over the sides of the planter. Great “spiller” options for winter are english ivy, vinca minor and/or fresh evergreen garland. If you use fresh garland or any live evergreen branches make sure to spray them with an anti-transpirant solution like Wilt-Pruf when you do the installation and keep them misted with water throughout the holiday season so they don’t dry out. In the picture above, we’ve used two leland cypress and boxwood as the “thrillers”, pinecones and berries as “fillers” and ivy and garland as our “spillers”. Doesn’t it look festive for the holidays? Once the holidays are over, just remove the pinecones, berries and garland and the evergreen and english ivy will look great all winter long. We have plenty of other examples of holiday planters our website, www.adornplanters.com, or you can follow Adorn on facebook or instagram for pictures and videos posted daily. We could talk about container gardening and creating curb appeal all day long. If you are involved in a garden club, or have an upcoming team building or girls night out event, we’d love to be a guest speaker on all things curb appeal and container gardening! From a formal presentation to a hands-on, get your hands dirty workshop where you create and plant your own container. Give us a shout at 405-255-1730 or Elizabeth@adornokc.com and we can get something scheduled.